Home of "The Smallest Theatre in the World," in which Dickens and Collins first staged The Frozen Deep in 1857. While living at Tavistock House, Dickens wrote Bleak House, Hard Times For These Times, Little Dorrit, and A Tale of Two Cities, and collaborated with Wilkie Collins on the melodrama The Frozen Deep. For the initial production of this play, as well as for The Lighthouse, and the children's plays William Tell, Tom Thumb, and Fortunio and His Seven Gifted Servants, Dickens converted the house's large schoolroom into "The Smallest Theatre in the World." The first such play presented there during his first Twelfth Night entertainments the burlesque Guy Fawkes by Alfred Smith. After three months of feverish preparation, The Frozen Deepwas first performed on 6 January 1857 to a select audience by an amateur cast composed of Dickens's friends and family, with CD himself in the role of the self-sacrifing Richard Wardour. In 1857, Dickens achieved the boyhood dream of acquiring Gad's Hill Place, Higham-by-Rochester, Kent, at about the same time that he met Ellen Lawless Ternan; the following year, he and Catherine separated, and it was then only a matter of time before he quitted the London residence where he and his family had spent so many happy times together. 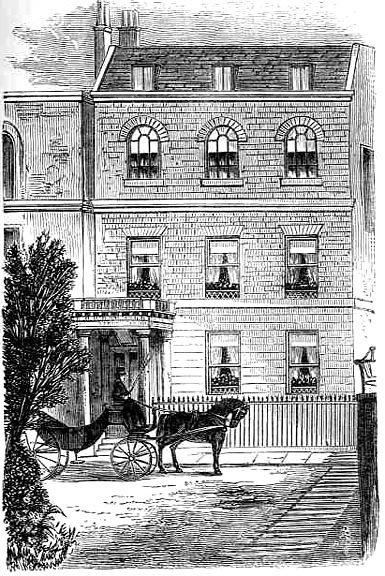 In August, 1860, he sold Tavistock House for two thousand guineas, and moved out the following month; all the mouldings and pictures were translated to Gad's Hill Place.